John's office is an ongoing project, but I thought I'd post images of where it is right now. John is going for a steampunk* vibe and there are some cool elements so far. There are framed dime store covers from the 1950's over a faux leather loveseat--which is where we spend most of our evenings since it sits across from a big screen television. (Grin). The credenza behind the desk features a lamp we found at an antique store. I found you can purchase "old timey" bulbs at Home Depot so it looks authentic when lit. Will and Sunny gave John a cool steampunked gun that is sitting on the left for his birthday this week. 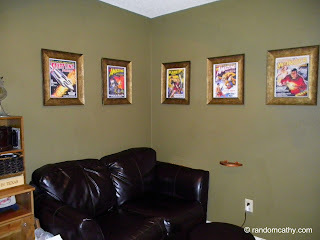 John's shelves are made from copper piping and fun across the doorway then finish out to the right of his desk. Speaking of the desk....that is likely the next project. And it would be really cool if we get to the computer and the television next. * If you aren't familiar with the genre, the urban dictionary captures it well: "Steampunk is a subgenre of fantasy and speculative fiction that came into prominence in the 1980s and early 1990s. The term denotes works set in an era or world where STEAM POWER is still widely used—usually the 19th century, and often set in Victorian era England—but with prominent elements of either science fiction or fantasy, such as fictional technological inventions like those found in the works of H. G. Wells and Jules Verne, or real technological developments like the computer occurring at an earlier date." If you Google the term and search the images, there are some amazing things that people have created.